Andrew Gillum, the Democratic gubernatorial candidate in Florida, conceded to his Republican opponent, former Rep. Ron DeSantis, on Saturday, ending a protracted fight that saw the Tallahassee mayor take back his Election Day concession during a statewide recount. The concession ended Gillum's first bid for statewide office in Florida, but the run -- despite his loss -- vaulted the 39-year old politician into the upper echelons of Democratic politics. "R. Jai and I wanted to take a moment to congratulate Mr. DeSantis on becoming the next governor of the great state of Florida," Gillum said in a Facebook video in which he appeared alongside his wife. "This has been the journey of our lives." 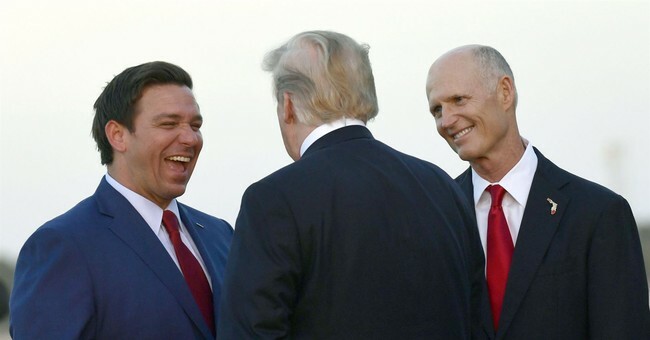 DeSantis responded to Gillum's concession with a call for unity. "This was a hard-fought campaign," he wrote on Twitter. "Now it's time to bring Florida together." Lawyers discovered that several of the 10,000 overlapping ballots, which clearly marked a vote for the agriculture race but were unclear in the Senate vote, appeared in Saturday’s piles. “It appears there may have been some envelopes from yesterday mixed in,” Carpenter-Toye said. Republican lawyer Joe Goldstein asked for a do-over to Saturday’s manual recount so the offending ballots — he said he saw around 10 envelopes’ worth — were fully sorted out...Snipes told the board Saturday that she believed human error in the sorting of ballots contributed to the discrepancy between the first count and the machine recount. That, she said, was the “most accurate” explanation of what happened. “The votes are in the building,” she said. “I know that sounds trite, it sounds foolish.” She said some staffers tasked with sorting ballots ahead of the machine recount were “not as well trained as some others” and that led to some ballots being “probably mixed in.” “I’m not blaming anyone,” she said. Republican lawyer Joseph Goldstein cautioned Snipes not to double count any votes in fixing the errors with the machine recount. Throughout this entire process, Broward has been an embarrassment, full stop -- and Broward officials' administration of elections has been an embarrassment for years. It's important that conservatives continue to press for a final resolution to aforementioned law violations, and more importantly, the apparent organized fraud by Florida Democrats we outlined last week. Just because Republicans eventually prevailed by sufficient margins this time doesn't mean that full explanations and accountability are no longer needed. Brenda Snipes' resignation is certainly a start. Anyway, with DeSantis' win, Republicans will control 27 governorships across the country, to Democrats' 23. That's a net gain of six for the opposition party (flipping Illinois, Kansas, Maine, Michigan, Nevada, New Mexico, and Wisconsin), with Republicans only picking up Alaska. In the Senate, Mitch McConnell will lead a 53/47 GOP majority, up from 51/49. McConnell has said that especially in an era of divided government on Capitol Hill, his top priority will be the continued confirmation of federal judges. His already-historically-fruitful partnership with President Trump on this front will continue apace for at least the next two years, now with a more comfortable margin for error in close whip counts. This could prove crucial in the event of additional high-profile judicial confirmation battles. Re-read the stat I posted above; Kavanaugh mattered, and Republicans swelled their Senate numbers because of Democrats' outrageous conduct.